I don't know if your kids are like this, but my girls love looking at old photo albums of themselves as babies and little kids. We have stacks of random pictures and photo albums and tucked amidst the books on our shelves, my oldest daughter (now 20!) came upon a baby diary. She was thrilled and started reading about the day she was born, her first bath, her first few days at home, and then after a couple of weeks and maybe five pages, the rest was blank. "What happened here?" she asked. But the other day when I was looking for a baby gift for my cousin, I came upon a baby diary book unlike any other. 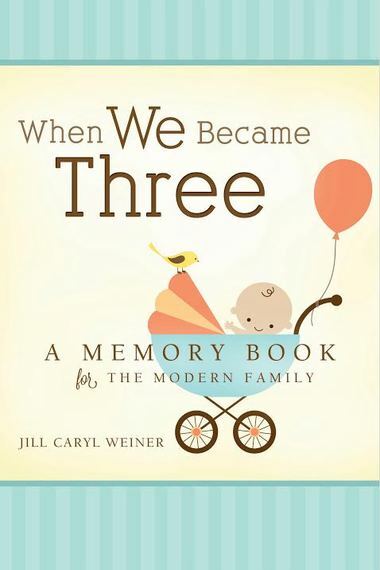 As I leafed through this book called When We Became Three my head started filling up with images of that bewildering and transformative time when my now college-age daughter was born and my husband and I went from two to three, (and a year and a half later to four and then five! You'd think those moments were lost, but the amount of details I had internalized was fascinating and somewhat thrilling. There was something about how this book framed the prompts that stimulated my memories, but also made it so easy to imagine filling out, and presenting as a gift to my kids the next time they were perusing the old photo albums! I know that these memories are so vivid in all of our minds, whether you are expecting, have just delivered, or in fact like me, that your kids are in college or even older. A mother never forgets. The visual images that this book stimulated made it unbelievably easy for me to imagine taking an hour and filling it in. For this Mother's Day -- which I always advocate as a time to buy yourself a present -- buy yourself a baby book and relive and record that early history of when your first was born. (Or that early history of your growing family.) Even if you don't remember everything or go through the whole book, there will be an assortment of wonderful memories and feelings that will come back to you -- and you'll be creating a biography of that remarkable time. It's also a compelling way to reconnect with your husband. Baby gifts never get old.